By now we all know about the craft beer movement that has swept across the country and my last post was on craft whiskey, but you probably are not familiar with a similar heirloom (craft) popcorn revival in this country. As with craft beer, people are searching out artisanal and more flavorful (as well as healthy) snack options, which includes their popcorn. As a recent New York Times article profiled (see link below), popcorn also has a growing appeal to several other market growth segments: weight-conscious, gluten-free and local food consumers. According to the research firm Information Resources, sales of bagged, ready-to-eat popcorn jumped 27% over the last year. This compares quite favorably to potato chip sales, which grew less than 3% during this same period. The obvious suggestion for our grocery and specialty food clients is to consider elevating the in-store profile for popcorn, especially if you carry local and/or craft/artisan brands. A small footprint feature display can be set up quickly and without a large expense by using our 2-Wheel Cart or Crate Merchandiser fixtures, which are both totally mobile and can be placed anywhere in your store. 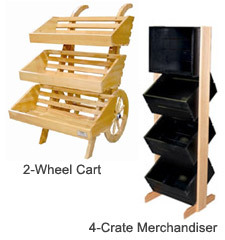 The 2-Wheel Cart offers an additional benefit of having that artisan, “farm-to-table” look; while the diversity of our Crate Merchandisers allows you to use them for just about any type of quick-hit feature display need you may encounter.